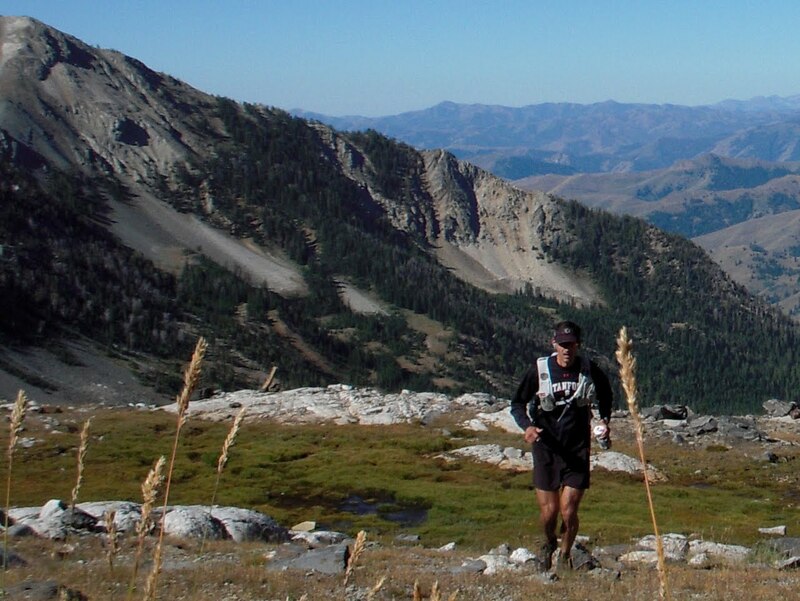 A beefed up version of Nathan's race vests with room for pretty much anything you'd need for those epic runs in the backcountry. Testing the Nathan Synergy hydration pack for the first time on a multi-hour run was a lot like visiting the beer aisle of the local grocery store and being pleasantly surprised to find that your favorite hand-crafted ale now comes in larger 22 ounce bottles. Most of the time, the regular 12 ounce bottles are perfect, but some special occasions just call for the big boys. It's the same with the well-crafted Nathan packs. For most decent distance runs and even 100 mile races, the sleek Nathan HPL #020 hydration pack will fit the bill perfectly (see RJ review), but for some longer training runs and unsupported outings, you need just a bit more. 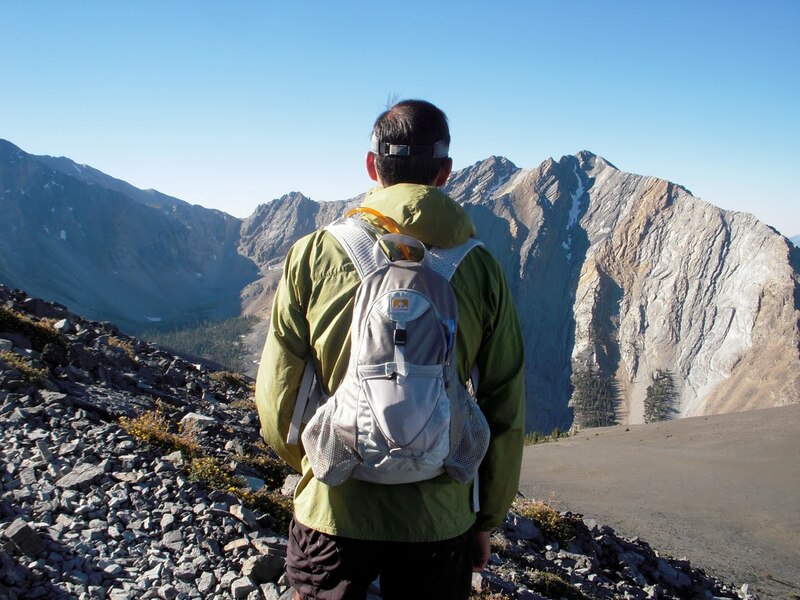 Enter the pleasantly surprising Nathan Synergy hydration pack. 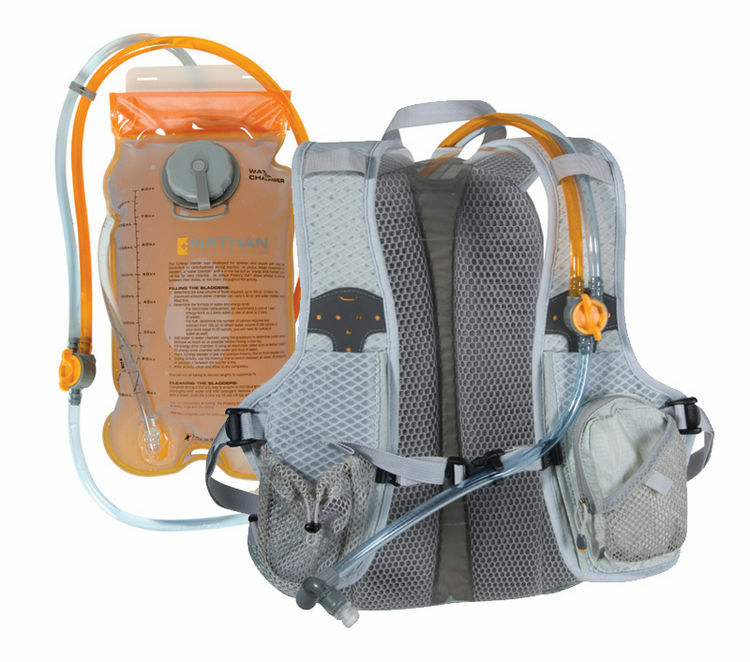 The Synergy, so called because of its dual-chamber 3-liter bladder - one side for water, the other for sports or electrolyte drink, is basically a larger, very close cousin of the Nathan HPL #020, with a few improvements. While the front of the pack has the same adjustable sternum strap, tube clip, and slightly small dual front pockets (one zippered) just big enough for half a peanut butter sandwich, a camera, or a handful of gels as the #020, the rear is where the differences come to light. First off is the size. The larger 750 cubic inch main compartment is perfect for unsupported runs in the 4 hour plus range. The pack can fit a full 3 liter bladder and still have plenty of room left over for a SteriPen, just-in-case clothing, and a lot of nutrition. Packing for such outings with my bursting #020, I often had to make a choice in the end between my camera and my SteriPen because there just wasn't enough room (guess which item won out). Other improvements include a more secure outside bungee cord and the addition of a secure light mesh outer sleeve for stowing items like food or a jacket that you'll likely need easy access to. 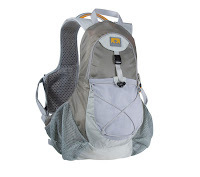 The Synergy also has two mesh side pockets that ride above the hip. They can each fit a water bottle, but I found my elbows rubbed against them, which could just be an oddity of mine. They worked great, though, for bulky food items (sandwiches), a small map, and, my favorite use, the baggie I use for my spent gels. Despite it's extra size and weight, it fits like most Nathan packs with the "2-Way Propulsion Harness," which is to say that when you first put it on you'll think it doesn't fit quite right - since it lacks the locked and loaded feeling of most classic packs - but after the first few steps you'll hardly notice it. The Synergy does trap more heat than its stripped down cousin #020, but compared to similar larger packs - like the Go Lite Rush - it's certainly airier and cooler. On what for many may be the main selling point of the Synergy - the dual chamber bladder - I'm a bit more neutral and not just because the side by side clear and orange tubing hint at the Borg Collective. The system certainly functions as advertised. There's a large chamber for water and a smaller chamber for sports drink or electrolyte drink (with a total capacity near 3 liters), and the potency dial allows you to choose what percentage of each you want going though the nozzle. I was surprised, though, that the bladders were different sizes, since I like to drink equal amounts sports drink and non-calorie electrolyte drink when I run long. Having equal-sized chambers would seem to have also made it easier to figure out how much you might have left of each as the hours march on. As it is, it required even more guessing than usually goes along with bladder hydration. The dual-chamber bladder is also a bit harder to remove and fill than a standard bladder. This isn't a real problem in the kitchen before a training run, but at a race it could be a real aid station show-stopper. Of course it's easy to pop out the dual-chamber bladder and replace it with a standard bladder if you feel like going with simplicity and saving a little weight, which I did on one occasion, and no graft vs. host rejection resulted. 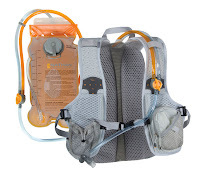 I know the Synergy may run counter to the current minimalist zeitgeist of sticking one's bottles down the back of one's shorts, but if you're looking to carry enough fluids, calories, clothes, and the odd electronic accessory for an unsupported multi-hour run in varied conditions, it just may be the pack for you. Sometimes it's really nice to have the 22 ouncer, even when the 12 ouncer would do.